#BJJ IS ABOUT THE COMMUNITY | What are you doing to make BJJ better? What are you doing to bring more people into our sport (women and children especially) too help them learn how to protect themselves, to protect each other, and to help each other grow? BJJ is anti-selfish by design. We need each other. By making each other stronger, we make ourselves stronger. We weed out what doesn’t work amazingly quickly, because we apply it every day. If you go to the mats only thinking about how to make yourself better, you’ll never understand what BJJ is truly about. You also probably won’t be that good. BJJ is about sharing. It’s about teamwork, support and efficiency. It’s about not alienating those who need BJJ the most. It’s a horrible thing when disasters strike our community, but a silver lining always sticks out to me when something does happen. It allows us to see how good of humans we are in this community. Maybe it’s just 97% of us, but that’s a whole lot of people. Artists, teams/gyms, bloggers and athletes all step up to help those in need. This disaster in the Philippines is a perfect example of what we’ll do to help others. The Meerkatsu,Gawakoto and Scramble collaboration T-shirt sold out in what felt like 30 seconds on BJJhq. 100% of proceeds are going to support charities in the Philippines. Those men are true ambassadors of BJJ. Pay attention to who is doing what for our community, and how we as individuals and companies represent ourselves inside and outside our community. The words “martial arts” have lost a lot of their meaning over the years, but I think if any community is to be prime example of who still holds onto their integrity and community driven message, it’s us. I, for one, want to keep it that way. 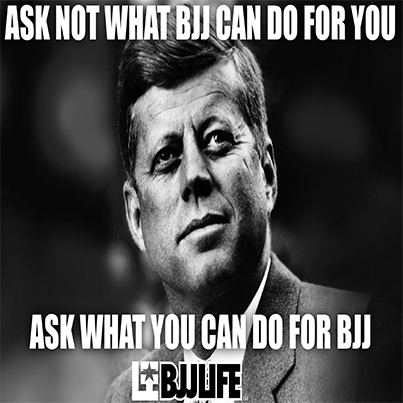 And when I say “Ask what you can do for BJJ”, it means, ask what we can do for each other” because we ARE BJJ.